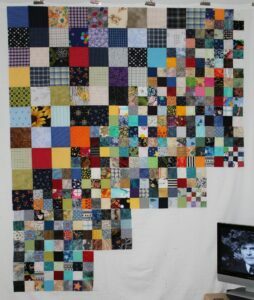 All the large and medium squares have been sewn into blocks and the first four rows are complete. The remaining three rows will take longer since they will include blocks made with the smallest squares. I think that I will add an inner and outer border to make it a bit larger. All of these squares were sewn as leaders/enders while working on the hexagons for my One Block Wonder. I really need to come up with a better name for this quilt top. Anyway all the hexagon blocks have been sewn (the stack is 8″ tall), so now it is time to start the design process. I didn’t count how many blocks there actually are, but my best guess is somewhere between 125 – 140. I also managed to find time over the weekend to sew the remaining 20 string blocks for Wild Child by Bonnie Hunter. Next up will be string blocks for Zuckerwatte. It has been great to have a machine set up just for string blocks without having to clean everything up to sew on something different. 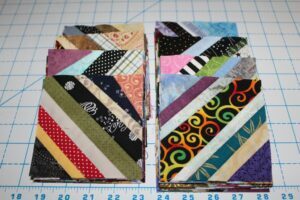 I also like the idea of having several quilt projects cut out and ready for sewing as leaders/enders. Lots of scrappy goodness in that project! And a lot of stitching! It is an interesting pattern because I think that the final 1/3 of the project will take me as long or longer than the first 2/3. It is a lot of stitching but I am doing it as leaders/enders so it doesn’t seem like that much. 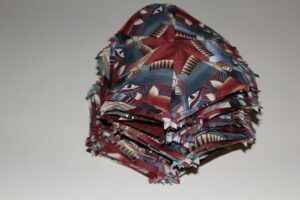 The name of the pattern is Four Patchwork and can be found at the Temecula Quilt Company’s store. It is a great way to bust some scraps. Thank you for stopping by.